Looking for a hearty dish for your brunch menu? 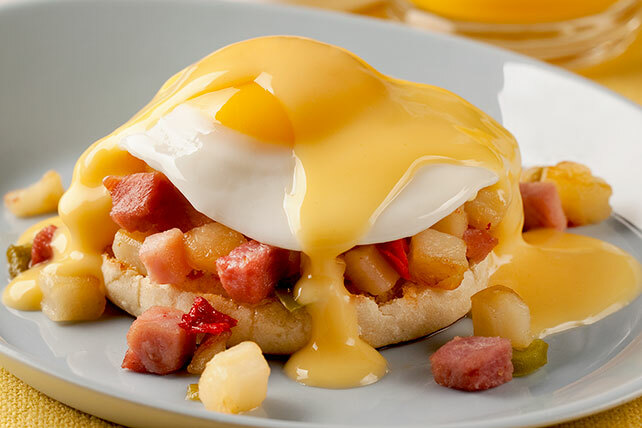 How's this: English muffins topped with ham-flecked potatoes, cheddar soup and poached eggs. Heat oil in large skillet on medium-high heat. Add potatoes; spread to form even layer on bottom of skillet. Cook 7 to 11 min. or until lightly browned, stirring occasionally. Stir in ham; cook 1 to 2 min. or until heated through, stirring frequently. Remove from heat; cover to keep warm. Cook soup and milk in saucepan on medium heat 3 to 4 min. or until heated through, stirring frequently. Place muffin halves, cut sides up, on 4 plates; top with potato mixture and eggs. Drizzle with soup mixture.